Your diet is made up two kinds of sugar: those naturally found in foods and those that are added to your foods. Some foods like dairy products or fruits contain naturally occurring sugars, while almost all processed foods contain some sort of added sugar. Limiting your intake of food and drinks with added sugars can help you lead a healthier lifestyle. Although naturally occurring sugars found in fruits and dairy products are still a source of sugar, these foods also provide many other healthful nutrients. Naturally occurring sugars are found in milk and milk products. 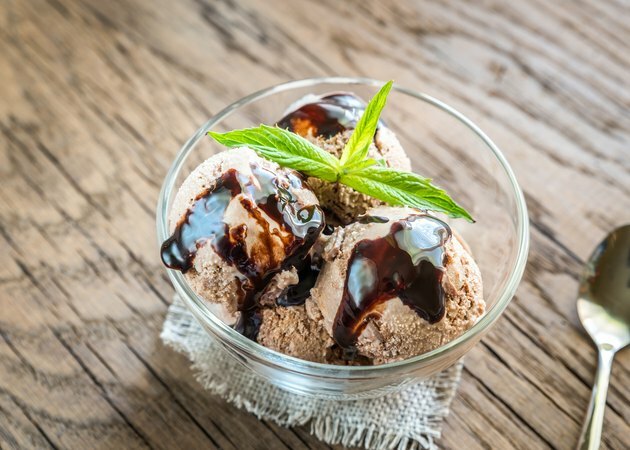 The highest sugar foods in this food group include 1 cup of chocolate soft serve ice cream at 58 grams, 6 ounces of fruited yogurt at more than 35 grams and 1 cup of chocolate milk at 25 grams of total sugars, both natural and added. The lowest sugar foods in the food group are 6 ounces of plain or artificially sweetened fruit yogurt at less than 8 grams or 1 cup of milk at less than 13 grams of total sugars, all of which are naturally occurring. Most cheeses, eggs, butter and sour cream contain less than 2 grams of total sugars. Dried fruit contains a lot of sugar for it's compact serving size. A 1/2 cup of raisins contains about 49 grams, and other dried fruits such as apricots, peaches, plums or prunes all have 30 or more grams of total sugar per 1/2-cup. Grape juice has the highest total sugar among juices, with almost 36 grams per cup. Canned fruits in light syrup such as fruit cocktail, peaches, pears and unsweetened pineapple provide 30 to almost 34 grams of total sugars per cup. Whole fruits provide much less sugar than dried, juiced or canned varieties. One cup of tangerine or gold kiwi slices provides a little more than 20 grams of total sugars; raw cherries, pineapple, oranges or plums provide around 17 grams per cup. Berries are the lowest sugar fruits, with 6 to 7 grams of total sugars per cup. Added sugars mean more calories without many nutrients. Soft drinks and energy drinks top the list for total sugar. One soft drink may contain as much as 61 grams of total sugars for a 16-ounce serving, and an energy drink can have up to 54 grams in a 16-ounce serving. Fruit-flavored drinks may provide anywhere from 25 grams to more than 37 grams of total sugars per cup. To decrease sugar intake, unsweetened black coffee, tea or water and sugar-free diet drinks are a great option instead of high-sugar soft drinks, energy drinks or fruit-flavored beverages. The American Heart Association recommends that women limit their intake of added sugars to 6 teaspoons a day and men to 9 teaspoons each day, which is the same as 24 grams and 36 grams of sugar, respectively. Every 4 grams of total sugars listed on the nutrition facts panel is equal to 1 teaspoon of sugar. Both added sugars and naturally occurring sugars are included on the nutrition facts panel. If the ingredients list includes sugar, sweetener or syrup of any type, concentrated fruit juice, fructose, sucrose, glucose, lactose, maltose, honey or molasses, the food contains an added sugar. In foods that contain only natural sugars like milk or whole fruit, the ingredient list does not contain any added sugar terms.